The UPS Store has a unique program supporting children’s literacy in their stores. 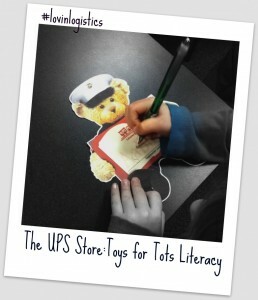 It’s called the Toys for Tots Literacy Program. Most franchises have a cash donation box and also allow donors to give new and gently used books. Another reason I’m #lovinlogistics! That kid’s hand looks suspiciously familiar. Usually it’s wanting me to talk to it…the hand, that is.